The highlights of the holiday home The following premises are available: 4 bedrooms and 2 bathrooms. The living area is 130 m² and is designed for up to 10 people. Opt for this holiday home with completely positive customer reviews! Families with children have already spent their holidays here and recommend the accommodation for a family holiday. This property has been rewarded with outstanding customer ratings: 4.5 out of 5 stars, which are above the local and regional average, testify to the satisfaction of the guests. This beautiful, well maintained wooden house is located on a large, fenced plot. There are 4 parking spaces on the property. The house is child-friendly and furnished with cozy furniture and is surrounded by forests and fields, ideal for a holiday in the countryside. Here you have a true paradise, the perfect rest area. On request bicycles. 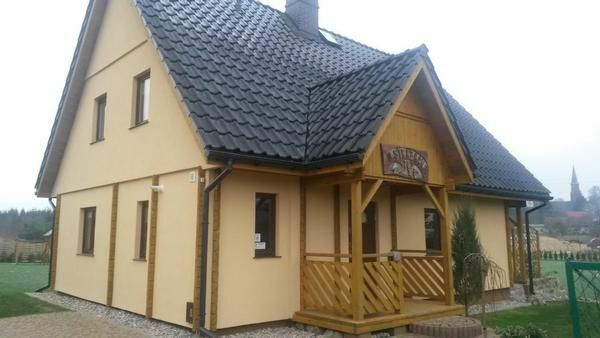 Nice wooden house in a quiet location near forests and meadows. It is a friendly family with children. It has slides, swings, sandpit. In overs 40 m from the house a complex of sports fields (tennis, volleyball, football). The area of ​​the region. 1030 m2 at its disposal. fishing side possible. Guests can barbecue or sit by the fire, which is located next to the house. Possibility to rent bicycles. The beach and the sea, only 4 km away, are a great asset for this hotel. 3 km to rent pedal boats, canoes or boats. 12 km boat trips and the possibility to rent a catamaran or watercraft. Pet: once per animal costs 30 EUR (compulsory). Fuel fireplace: per object and week costs of 50 EUR (optional). Tourist tax: per person and day costs of 0. 6 EUR (obligatory). Bed linen: to rent per person per week for 8 EUR (optional). Final cleaning: per person and week costs of 8 EUR (obligatory). Linen (per person per week, according to consumption: EUR 8). Pet (per object and day, included in the price 0 EUR). Internet (per object and day, included in the price 0 EUR). Parking (per object and day, included in the price 0 EUR).